Battery Park in New York - The Statue of Liberty, Ellis Island. Battery Park is located at the southern tip of Manhattan. You can come here directly via the subway. 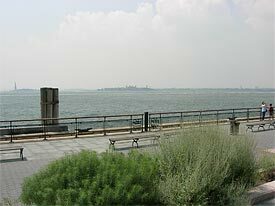 The Battery (Battery Park) is one of the oldest places in New York. Dutch settlers disembarked here year 1623 and founded New Amesterdam. It is very close to Wall Street from here and the ferry leave to Statue of Liberty and Ellis Island. The landmark for Battery Park is Castle Clinton, that has been used as a fort, aquarium, concert hall and immigrationstation. 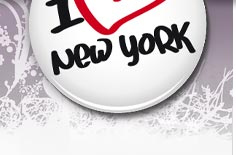 Here you also buy the ticket to the Statue of Liberty and Ellis Island. Many places worth seeing is just in a short walking distance, as the New York Stock Exchange, Staten Island Ferry, the Smithsonian´s Museum of the American Indian, the Museum of Jewish Heritage and the groovy South Street Seaport, where you have an excellent view of Brooklyn Bridge. The Battery is called - "the emerald doorstep of the metropolis". In the area around the Battery approx 280.000 people are working and approx 20.000 are living here. Memorial monument from the terror attack against World Trade Center on Sept 11, 2001. The Sphere was standing in a fountain outside the entrance to WTC as a monument for world peace. Memorial statue of all the different ethnic groups that arrived as immigrants to the US.